In a rat and dog relationship, they can make a good couple in most cases. A dog is a loyal, sincere, straight forward character. Chinese astrology compatibility predicts that they have the ability to make the pessimistic dog animal sign feel better, as they are happy under the rat’s care. While a rat is charming, sentimental, and aggressive it’s some of the opposite qualities that attract them to one another. As it turns out they find the Dog sign’s pessimism a great challenge, and they love to be challenged. They also have the ability to see the dog’s qualities as a true friend. A Dog man and Rat woman in love will be cheerful and smiling. Yet problems arise when he gives what they have to others without thought, or consulting her, she will get angry but he will forgive her. The Chinese Dog woman and Rat man as soulmates will tend to be more of a friends than in an actual sexual relationship. The dog can help the rat mature as he helps to teach her assurance, poise, and grace. In bed they will be understanding. If they have children, they will remain together, as they are their lives. Family means everything to this Rat Dog compatibility. The dating experience between the rat and dog has the capability of being a great one. They just need to be able to open up to one another and share, share their hopes, dreams, expectations, feelings, just everything. Both these Chinese astrology signs are intelligent and hard-working; they would make good business partners with the rat running the show and the dog being the face of the business. The dog can see the hearts of their clients, while the rat can use his shrewd mind for business. Dogs can have a bit of a temperament, they are known for being irritable, moody and extremely sharp with their tongues. Surprisingly the rat finds these qualities to be enticing and exciting. That’s good, without excitement, the Rat Dog love compatibility can get boring rather quickly. This can lead to the rat being unfaithful. As long as the dog’s steadier qualities don’t get to tedious for the rat, things can go well here. If either the Rat man or Dog woman or vice versa, doesn’t feel like they are loved or being taken care, or just in general missing something in the relationship, they may go looking go it someplace else. This too can be avoided, make the dog feel loved and cared for. A Chinese rat sign is usually very shrewd with their money, and dogs like to help others at almost any cost. This can become a big issue in the Rat Dog friendship. Another big issue that is likely to rise are trust issues. The dog female or Dog male are an extremely loyal companion and really has a difficult time seeing or trusting anyone to be as loyal as they are. When a fight happens it may be quite the bicker. The rat female or Rat male loves to nag and the dog is awfully stubborn and will argue to no end. For them it just doesn’t matter how the argument ends as long as they are right. A dog can often been emotionally cold and be able to endure anything life throws at them. They will even be ready for the breakup of the Rat dog match. 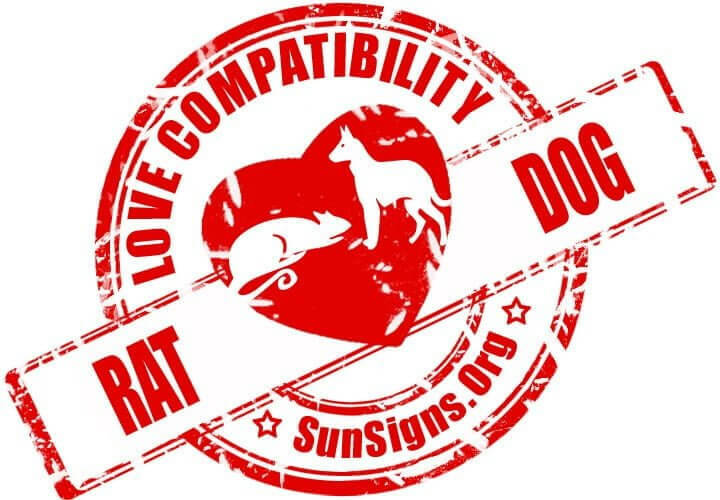 Rat & Dog Chinese Horoscope Compatibility Rated 4 Hearts! Previous You Made It To Your First Anniversary! Here’s 15 Fun Ways To Celebrate!